Director John Scheinfeld talks about his new documentary, "Chasing Trane"
This article appeared in the June 2017 issue of JazzTimes. Director John Scheinfeld, never a diehard jazz fan before making Chasing Trane, discovered Coltrane’s penchant for silence the hard way. Searching for footage to help tell Trane’s story, Scheinfeld realized that TV interviews were non-existent and radio interviews were scarce and of subpar sound quality. He solved the problem in two ways: one, by having Oscar-winner Denzel Washington read Trane’s own words; and two, by acknowledging what Golson and countless other jazz fans have learned over the last half-century: that Coltrane could speak volumes through his saxophone. 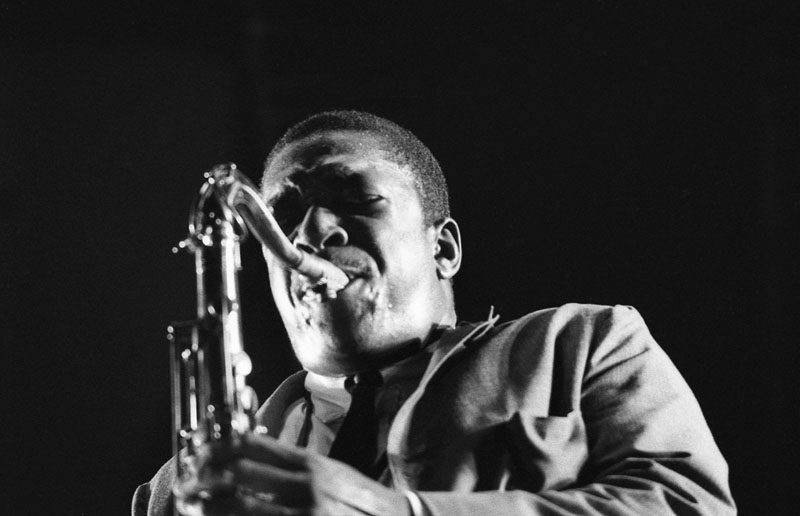 Though it outlines the saxophonist’s familiar biography, from his birth in North Carolina through his apprenticeships with Dizzy Gillespie and Miles Davis, his struggles with heroin addiction, his spiritual rebirth and his premature death, Chasing Trane crucially keeps its subject’s music at the center of its story. While the words recited by Washington offer insight into Coltrane’s thoughts and feelings, Scheinfeld wisely lets the music—with dozens of recordings at his disposal, from every phase of Trane’s wide-ranging career—carry the narration. Through this process, combined with the usual talking heads (including Sonny Rollins, Jimmy Heath, Wynton Marsalis, Wayne Shorter, Carlos Santana, Kamasi Washington, Dr. Cornel West and writers Ben Ratliff and Ashley Kahn) and archival footage, Scheinfeld manages to tell an oft-told story in a way that seems fresh to even the most dedicated Trane-spotter. Having directed similarly revealing docs about John Lennon and Harry Nilsson, Scheinfeld offers a portrait that takes in the socio-historical—especially in a sequence on “Alabama”—and spiritual contexts in which Coltrane created his masterworks. Not long before the film’s New York premiere, we caught up with the director via phone. JazzTimes: You’ve previously made films on rock stars and Hollywood actors. What brought you to John Coltrane? John Scheinfeld: Like many people I was introduced to Coltrane through “My Favorite Things,” when I was doing a radio show at Oberlin College. I came across it in the record cabinet and put it on and was just blown away by that track, but to be honest I was not an obsessed fan. I respected him and knew he was an iconic artist, but it was one of our producers, Spencer Proffer, who asked me if I’d be interested in making a film about Coltrane. The more I looked into his story, the more I thought it was very unique and special. We all know about artists who came from nowhere, exploded onto the scene, had great success, made a lot of money, maybe abused some substances and died young. That’s a bit of a cliché in the music business. But Coltrane is the antithesis of that. Yes, Trane had his challenges, but it was once he overcame them that he ascended and became the iconic figure we know. This is a very uplifting and inspiring story, and that’s what got me excited about making this picture. That has to be a refreshing change, given the tragic narrative arc that so many music stories take. Very much so. But there’s another aspect to Coltrane’s story that makes it so unique, and that’s the spiritual journey he was on. I’ve interviewed a lot of rock-and-rollers, and they’re not the least bit embarrassed to admit that the reason they got into music was to get girls and score drugs. Coltrane is different in that from the very beginning this blend of music and spirituality was part of his life, and that was incorporated into his art. You really allow his music to tell a significant amount of the story. Because we had the participation of the Coltrane estate and the support of the three record labels that collectively own the lion’s share of his catalog, we were able to include almost 50 recordings in this film. In his extraordinary catalog I found every mood, every tone, every color, every emotion that I needed to help tell his story. What people will hear is an extremely broad range of Coltrane’s output, and I think even those familiar with his music will be able to hear and appreciate it in a new and exciting way. How did Denzel Washington get involved? In his lifetime, Coltrane did no television interviews and only a handful of radio interviews, and the sound wasn’t good enough for me to use. But I did want him to have a vital presence in the film, beyond just the performance clips. Happily, he had done a number of print interviews during the height of his career, and I was able to take extracts from those and pepper them throughout the film to illuminate what he might have been thinking or feeling at a particular time. Because I’m relentlessly optimistic and I aim high, I wanted a movie star to read these words. The reason Denzel was first on my list was not only because he’s a superb actor and one of the biggest movie stars in the business, but if you think about the characters that he’s played onscreen, most of them embody a very quiet strength. A lot of people who knew Coltrane told me that’s the way Coltrane was. The film captures Coltrane’s response to the tumultuous times he was living in. Were you thinking about the ways that reflects our current historical moment? Yes and no. For me, to get at what makes an artist tick we have to understand the cultural, political and social landscape against which they grew up and lived. We started the picture long before the election of 2016. The Republicans were still trying to fight the Voting Rights Act of 1965 and other accomplishments of the civil-rights era, so I suppose in some small way that impacted us, but I feel that Chasing Trane is the right movie at the right time. As I mentioned before, I see it as an uplifting and inspiring story, and I feel this is very much needed in this strange time in which we’re living, where a darkness has swept over the land. To see the story of someone who followed their muse, who did things the right way, who created an extraordinary body of work, all from a place of love and heart and spirit, is very much needed in these times. Visit coltranefilm.com for screening and release info. See a slideshow of classic images of John Coltrane.